You wouldn’t be the first among your friends and colleagues to get a hearing aid, but that doesn’t make it any easier. 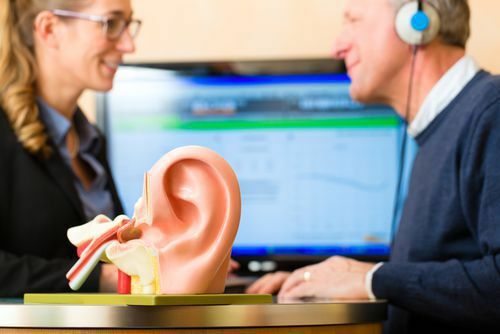 You have been putting off making an appointment with a hearing care specialist for several years, hoping your hearing just won’t get any worse. We know how hard it can be to live with hearing loss—the effort it takes to follow conversations, the loss of enjoyment in movies and TV shows, and the annoyance other people regularly have with you are just a few of the difficult effects of hearing loss. Now is the time to change all that. Schedule a free hearing screening at our North Naples hearing care center and take the first steps to better hearing and a better year. Understanding entire conversations. Even if you have no trouble hearing the other person in one-on-one conversations, you may be missing out on a lot in group conversations, meetings, or restaurant meals. Hearing correction can open the door to hear what you’ve been missing. Improved personal relationships. While your loved ones may be patient with you at first, they will begin to get annoyed soon enough. Their frustration with you can lead to your feeling isolated and depressed, choosing to stay in rather than go out. Correcting your hearing will make you more comfortable in social situations and improve your quality of life. Hearing TV, movies, and music more clearly. You may go along with others to movies and concerts, but you don’t really enjoy them because the sounds are muffled and you can’t follow plotlines. A hearing aid can not only fix that, it can give you the ability to control volume and create an ideal viewing experience. Better overall health. Studies have shown that people with hearing loss are at an increased risk for memory loss, dementia, balance problems, and depression. Correcting your hearing loss early can eliminate those risks and lead to a longer, happier life. Discreet and comfortable hearing aids. Today’s hearing aids are comfortable, easy to wear, and can even be completely hidden. Our hearing care specialist can show you models at your free screening. With the possibilities of these benefits, why wait any longer? Use the contact form on this page to schedule your FREE hearing screening at one of our Naples office locations. We will conduct a complete screening and discuss your results in a private consultation. You will leave with all the information you need to start your journey to better hearing.